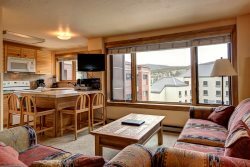 Our two bedroom Breckenridge condo is perfect for families and small groups seeking a quiet stay, comfort-ability, and an excellent location. Tucked away in the Four Seasons neighborhood just south of Breckenridge, the condo is located just 500 yards away from the Quicklsilver Chairlift on the base of Peak 9 and only ten minutes from the terrain on Peak10. The FREE shuttle stop is located right outside of the complex’s entrance, making it both convenient and fast to explore Breckenridge’s other peaks. The condominium complex is also just a mere three blocks from all of the premiere shopping, dining, and drinking that downtown Breck has to offer. Located on the second floor, the condo features a spacious 1,068 floor plan with great views of the surrounding shrubbery. The large master bedroom features a king bed, a full private bathroom, and access to the unit’s private balcony. The second bedroom features a twin bed with trundle below and a second, full bathroom. In the seating area, you will find ample couch space for entertainment, a gas burning fireplace, large flat screen TV, a queen sleeper sofa, and access to the private balcony. There is a full kitchen that comes stocked with all necessary plate ware, utensils, and pots/pans. In addition, there is an in-unit washer and dryer and high speed internet. Access to the clubhouse, indoor hot tub, ping pong tables, and a stationary bike machine. Awesome Stay. Perfect location and size for a weekend get away! Would definitely stay again. Perfect for our stay. A nice and very comfortable condo in a great location.